I’ve been wanting to write a post on Overthinking It’s “Female Character Flowchart” since I saw it on both Jezebel and Musings of an Inappropriate Woman about two weeks ago, and the time has finally come I’ve finally gotten around to compiling a list of my favourite fictional female characters and whether they qualify as “strong” ones. Without compromising the quality of the image, I wasn’t able to enlarge the chart, nor add my own annotations as per the below characters of my choosing. Instead, I’ve reproduced their equations below, as well as Mean Girls’ Regina George, who appears on the chart, and Blair Waldorf, whom Rachel Hills believes is a “girl Hitler”, but who I find to be much more of a genuine strong female character. Regina George (Mean Girls): Can she carry her own story? YES. Is she three dimensional? NO. Villain? YES. Sexualised? NO. (I would argue yes. Hello? Have you seen her Halloween getup?) Over 35? NO. Is the protagonist male or female? FEMALE. Is this a rom/com? 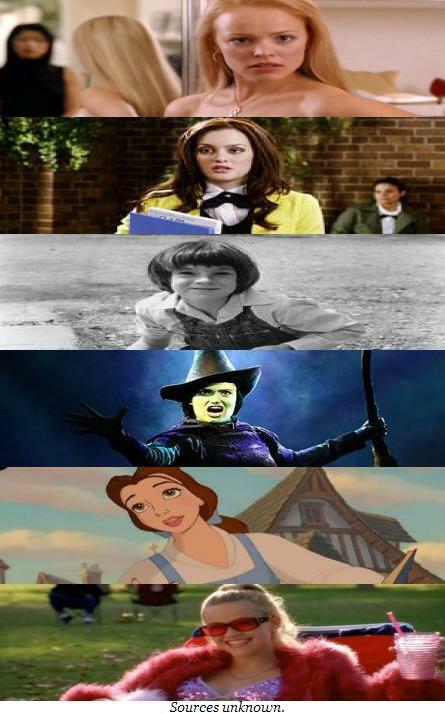 NO=Mean Girl. Blair Waldorf (Gossip Girl): Can she carry her own story? YES. Is she three dimensional? YES. Does she represent an idea? NO. Does she have any flaws? YES. Is she killed before the third act? NO=Strong female character. Scout Finch (To Kill a Mockingbird): Can she carry her own story? YES. Is she three dimensional? YES. Does she represent an idea? YES. Villain? NO. Is she mainly a love interest? NO. Is she part of a team/family? YES. What is her main role? LEADER. How does she feel about babies? NOT RIGHT NOW. Does she get pregnant? NO. Is she in a horror story? NO. Is she violent? NO. Is she nearly perfect? NO. What is her flaw?=sassmouth, which I guess is true, but Scout is so much more. Elphaba (Wicked): Can she carry her own story? YES. Is she three dimensional? YES. Does she represent an idea? YES, many. Villain? NO. Is she mainly a love interest? NO. Is she part of a team/family? YES. What is her main role? ROGUE=wildcard. Elle Woods (Legally Blonde): Can she carry her own story? YES. Is she three dimensional? YES. Does she represent an idea? YES. Villain? NO. Is she mainly a love interest? NO. Is she part of a team/family? YES. What is her main role? LEADER. How does she feel about babies? NOT RIGHT NOW. Does she get pregnant? NO. Is she in a horror story? NO. Is she violent? NO. Is she nearly perfect? YES. Is she older? NO. Should the audience like her? YES. Who likes her more? WOMEN=Mary Sue. 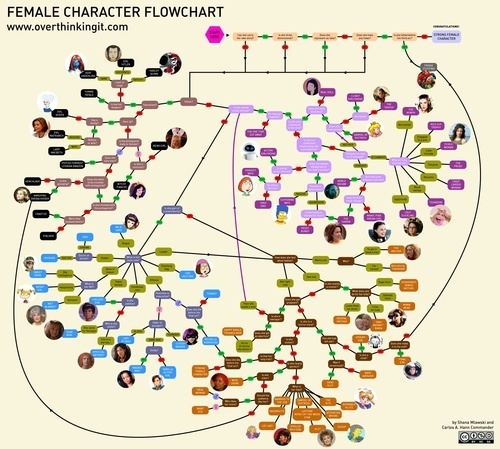 Elsewhere: [Overthinking It] The Female Character Flowchart. [Overthinking It] Why Strong Female Characters Are Bad for Women. [Jezebel] Flowchart: Know Your Female Character Stereotypes. 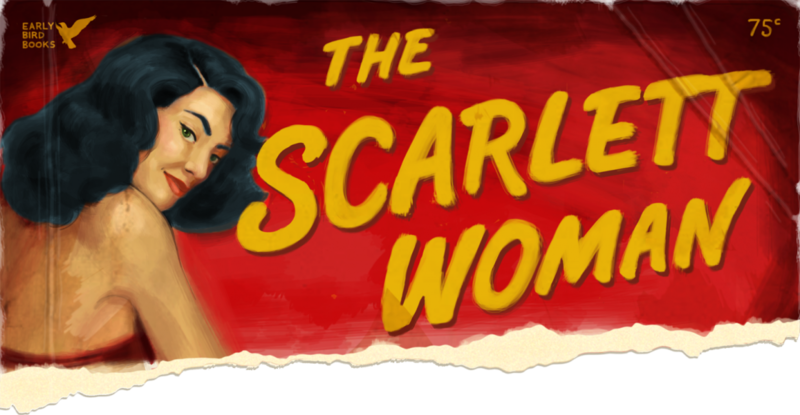 [Musings of an Inappropriate Woman] Flowchart: Know Your Female Character Stereotypes.